No compensation was received for this post. A complimentary ARC was provided for the purposes of review. 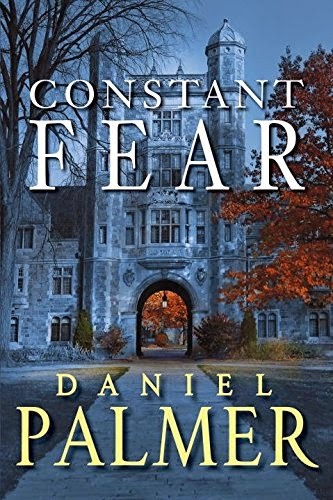 CONSTANT FEAR, Daniel Palmer's newest thriller, hits stores Tuesday! "It's the story of Jake, a father who's gone to extreme lengths to keep his diabetic son, Andy, safe from dangers that might never come. When narcoterrorists take over Andy's school, though, Jake may have the only real tools to fight them. How far will a father go to save his son? Read CONSTANT FEAR, and find out." When Daniel Palmer reached out to announce that his newest book would soon be out, I was very excited for a chance to read it. You see, I'm a huge fan of Daniel Palmer and found his books because I was also a huge fan of his father, Michael Palmer. It all started on a college trip called Dayton to Daytona that I joined in after my senior year of college. It was a great adventure that several friends and I had gone together for - taking a huge conversion van for the drive down. During that trip, I had read through the books that I brought along and headed to the gift shop at the hotel in search of a book to read. The one that I selected was Natural Causes by Michael Palmer. It was such an engrossing read, that I had to read more. I started picking up his other books and then got to a point where I read them as they came out. When Daniel started writing, I started reading. His dad wrote terrific medical thrillers and Daniel writes terrific techno-thrillers. Both father and son have a great ability to develop their characters, mix in a bit of love, and write a book that is just too believable that it is scary. Having already started the book and trying to fit in time to read in my busy schedule, I was glad to have a nice extended break between kid's activities on Saturday that gave me over a 6 hour window for whatever I wanted to do. And with the perfect weather this weekend for sitting out on the back deck while the kids played with friends and read, I had the right combination to have some quality me time and read. I was so engaged in the book that when we did run out for an early afternoon movie, I took the book with me. My husband mocked me for bringing it along for a five minute car ride when one of the kids said 'hey mom...' as soon as I opened the book to start reading. But, when a book is that good and you are getting to the climax of the story, the last thing you want to do is to wait to read it. One thing that I thought was unique about this book was that the person that was 'involved' in the techno part of the techno-thriller was not what I considered the main character, and in his other books they have been. Of course, Andy and his group of friends are part of the main group of characters, but it is Jake, Andy's dad, that is the main character in this story. The suspense begins within the first few paragraphs, and although there is a short break where the back story is developed, the intensity only grows from there. As a reader, the suspense in the first chapter heightened my want to read quicker...I wanted to understand why we were where we were and what exactly was going on. I love it when a book draws you right in and then takes pause to start to build the background. Daniel Palmer successfully shares enough about Jake and Andy's past and allows the reader to really get to know them and understand where they are coming from. If you are a fan of suspense and thrillers, this is a definite must read. Want to check it out? You can download the first chapter on Daniel Palmer's website and buy the book at your favorite book store or online. No compensation was received for this post. A complimentary ARC was provided for the purposes of review. All opinions expressed are my own or that of my family.